it only puts into motion what has been locked up in frost. I was disillusioned. It does not matter why; that blackened void is familiar to anyone who has ever sweated and hoped and desired, and then spat out the fouled fruit of disappointment. Etymologically, the verb ‘to disappoint’ comes from the 14th century French word disappointer meaning ‘to undo the appointment’ or ‘remove from office.’ And it was in such a state of frustrated expectation that I found myself the other day. I had made a appointment with Victory and she had stood me up. At the eleventh hour she had blithely skipped from the office, leaving me hopeless and bereft. The Texan came home and found me curled up, nursing my wounds on the bright blue upholstery of our new sofa. He took my hand and pulled me up. ‘No no no,” he shook his head. He led me determinedly out the door and through the neighborhood. ‘We’re going out,’ he said. Weary and numb, I walked with him through streets lined with bright houses and apple blossoms and arrived in the heart of downtown Ballard. It was Friday and the evening streets bustled with bodies released from offices, the air suffused with that unmistakable ebullience that marks the end of every working week. The rhythm of walking was soothing and the sense of bonhomie contagious, so that by the time we turned down Ballard Avenue, the earthbound pull on my heart had slackened ever so slightly. We turned right and ducked into The Sexton. With an abundance of bare wood, faded photos, and jars of house-made bitters displayed above the bar, this place exuded a trendy aesthetic, a carefully constructed evocation of an early 20th century watering hole. Wondering get again why our generation is so enamored of this era, the Texan and I perched at the bar and settled into a couple of Maritime IPAs. I sipped the hefty beer, served in the requisite mason jars, and felt another increment of weight drop from my heart. Life was not so bad; not when your fingers were slipped around a honey-colored brew and your bar stool snuggled up next to the Texan. Our first drinks drained, we perused the menu again. “Look at this,” the Texan pointed to an item below the list of cocktails. “Bet on Your Bartender,” the text read, and invited guests to state there preferences and let the professionals take control. We were sold. The spinner of our fate nodded and without pause dove into the spirits, pouring measures so fast I couldn’t keep track. She slid the drinks over to us, smiled, and flickered away to attend to the crowd. I felt rather than tasted the tequila reposado—the sweet air and baked clay of old dry land. But it was swathed in a tapestry of spice, faint oranges, and bitter herbs. I took another sip. The lead in my heart all but disintegrated under its potency leaving me giddy and fragile, as if recovering from a vicious flu. This was not a cocktail; it was a tonic. Questioning the man with the sinuous arms, we discovered that our bartender, Marley, is an esteemed maven of cocktails and walking encyclopedia on the history of any distillery you care to mention. “She’s insane, knows it all.” He spoke reverently. When Marley returned I asked her about my drink. What did this healing balm, this soothing elixir, contain? She reeled off a few names but I stopped her at Benedictine. Really? Who would have thought to put that with tequila. Holding the bottle, Marley pointed to three large letters, D.O.M., on the label and told us that they stand for deo optimo maximo, the motto of the Benedictine monks. “For our best, greatest God.” Sitting in The Sexton, watching the crowd grow warm and vociferous as the evening deepened, I thought about these monks and their liqueur. In my state of mind, it was comforting to think of these men; to know that one day long ago there were a bunch of serious, scientifically inclined monks, who, in the course of their experimentations, stumbled upon something so enduring and lovely. I sat back, contemplating my drink. Perhaps the alcohol was going to my head, but in that moment I felt sure it was a divine restorative. I looked around. At the other side of the room Dionysus stood; he grinned back at me and raised his glass. Be happy, he said, deo optimo maximo. Then he inclined his head and was gone. It is May Day. The cherry blossoms have blown down to paint the earth pink and the daffodils have risen and set like a million spring suns. Now this advance guard has departed, the season is here in full force. The air, rich with pollen and sap, has lost April’s bitter edge and the rain is soft and fine. Beginning in late April, the elderflowers arrive. They grow in creamy clusters on large, gangly shrubs. Although uncommon in American cuisine past or present, they have long featured on European tables. The Swedes are the most notable elderflower lovers, stirring them into fritters and jellies, and sipping on a juice made from elderflower saft, a sugar syrup infused with the petals. The French, with their particular talent for identifying alcoholic potential, are responsible for St. Germain, the elderflower liqueur. Not to be outdone by their neighbors, the Brits have a rural tradition of elderflower wine, generally of the lethal, homemade variety. In the US, however, this sultry flower relegated to a dusty corner and only appears in the odd champagne or gin cocktail. Yet I see no excuse for American ignorance of the elderflower. It proliferates throughout much of the country and sends out an alluring scent. Less brash than many blooms, its perfume is nevertheless distinctive—a heady mixture of honeysuckle, melon, and new-mown hay. There are a variety of elder species (genus Sambucus), and the zealous forager should be aware of which one she harvests. According to my research, the species growing near Seattle is Sambucus racemosa or Red Elderberry. Its flowers are virtually identical to other Sambucus varietals, but it bares red rather than blue berries. As a forager with a tendency towards hypochondria, I read all I could find on the subject of the plant’s toxicity. Sources vary and I cannot offer definitive advice. However, it appears that the flowers of most species are safe to eat once cooked. The fruit of all species must be picked when fully ripe and also cooked before consumption. Some accounts claim that the berries of the red elder are toxic in all forms. However, I found no reports of anything more drastic than a little digestive upset. Most of the toxicity lies in the stem, so when preparing the flowers it is good to remove as much stem as possible. With this proviso, a pinch of salt: many cultures have been using Sambucus for millennia and I personally feel a lot safer sipping homemade elderflower cordial than the chemical laden drinks on offer in every supermarket. And so last weekend I dragged the Texan out with me to pick flowers. Obligingly he held back the brambles and bent down the elder branches so I could pick to my heart’s content. Some women are satisfied with a bouquet of flowers but here I was demanding a whole bag full of blooms. So he wrestled trees, fought off biting ants, and suffered boggy ground and muddy shoes for me—ah, what a man I have! Home again we picked the flowers from their stems. It is a laborious and hypnotic process, but strangely satisfying. Once finished we made a sugar syrup, poured it over the petals, and left this to infuse. 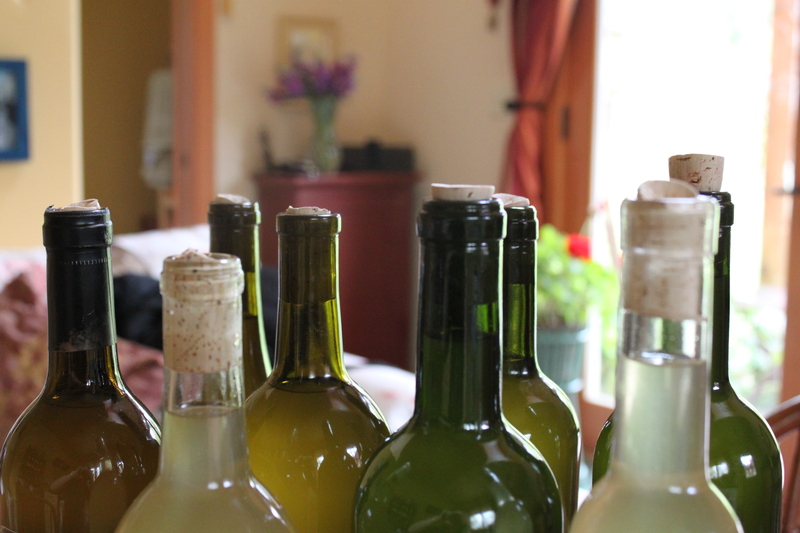 The next day we strained and bottled our spring nectar. We made a big batch, enough keep us in pancake syrup, cocktail mixers, and elderflower cordial for a good year. 1. Pick the flowers from the stems, place in a very large pot or bowl and add the lemon juice, zest, and citric acid. 2. Heat the water and sugar in a very large pot until the sugar is dissolves. 3. Pour sugar syrup over the flowers and stir. 4. Cover the mixture with a clean towel and allow to infuse for a day or so. This concentrate can be diluted with still or sparkling water for a delicate soft drink, or added to any number of alcoholic concoctions—swirled into a white sangria with white wine and seasonal fruit, or shaken with a pale tequila over ice. * A while ago I invested a corker. It looks like a massive reverse corkscrew and is highly entertaining to use; you need some muscle (again the Texan obliged) and there’s a satisfying clunk each time the cork goes in.